News out of Iraq indicates that the country’s de-Baathification committee has decided to remove the supreme court chief, Midhat al-Mahmud, because of his ties to the previous Baath regime. In some ways, the ruling is not really controversial: It is widely agreed that Mahmud’s leading positions under the former regime are in conflict with the requirements of the de-Baathification law from 2008 which are particularly strict when it comes to leadership of judicial institutions. Everyone knew that Mahmud had those ties to the former regime; his tenure at the supreme court was simply seen as one of many exceptions to the rule in the new Iraq whereby some Baathists were granted permission to stay on if they proved useful to people in positions of power – and in particular to Prime Minister Nuri al-Maliki. Additionally, Mahmud’s continued tenure as an octogenarian seems to be a conflict with a law still in force stipulating age limits for retirement of Iraqi judges at 68. Thus, rather than reflecting new legal realities or path-breaking judicial interpretations, the new situation regarding Mahmud has to do with a changing political dynamic in Iraq. Ever since the Shiite Islamist Sadrists and ISCI with Iranian support pushed the de-Baathification issue to the forefront in Iraqi politics ahead of the March 2010 parliamentary elections, there has been a shift of power towards Sadrist dominance of appointments to the de-Baathification committee and other legal institutions involved in the de-Baathification process. This was seen not only in the appointment of a new de-Baathification committee in May 2012. Also the composition of the appeals court for de-Baathification cases (to which Judge Midhat may now appeal) was influenced by Sadrist pressure in parliament. Finally, the recent passage by the Iraqi parliament of the law for the higher judicial council, which to some extent prepared the ground for the elimination of Judge Midhat, was seen as a bid by the Sadrists along with the Kurds and the secular and Sunni-dominated Iraqiyya to put pressure on Maliki. It is hard to overestimate the significance of this move against Prime Minister Maliki. Since 2008, the Iraqi federal supreme court has increasingly been seen as an ally of Maliki, often issuing rulings that strengthened the executive in ways that seemed in conflict with the constitution or even the court’s own past decisions. Tareq Harb, a lawyer close to Maliki, often prevailed with his arguments before the supreme court. Maliki, emboldened by judicial support, appeared to pay ever less attention to the fact that his parliamentary support base is in fact very limited. During the no confidence crisis of spring 2012 he failed to build bridges to disaffected factions of Iraqiyya and had to rely on support from Iran and the Sadrists to avoid getting unseated. To some extent then, this latest move is parliament paying back for Maliki’s arrogant approach to them. For these reasons, some will no doubt construe the de-Baathification of Mahmud as a welcome check on Maliki’s authoritarian tendencies. Still, those who celebrate this move should take into account the fact that the campaign against Midhat has been spearheaded by Shiite Islamist hardliners in the Sadrist camp. We can now ask the question of who the Sadrists will attack next using de-Baathification as a tool. For example, many of Maliki’s generals are also due for retirement if the de-Baathification law were to be followed to the letter. Some of these generals are part of the backbone of the system of relative security that has emerged in Iraq since 2008. 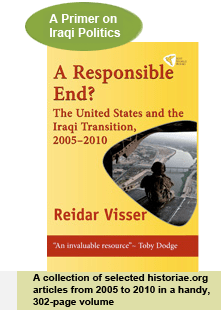 The secular and increasingly Sunni-dominated Iraqiyya’s support for the move is particularly ironic since Mahmud in many ways was one of them in the past. Their embrace of the decision (“finally the de-Baathification committee is taking on a Shiite” according to parliament speaker Nujayfi) in some ways goes to underline their own increasingly Sunni sectarian position. It could be argued that what we are seeing in practice here is that Iraqiyya effectively supports Kurdish separatist policies and Sadrist Islamist policies at the same time in order to weaken Maliki. It’s actually not the first instance of this either: Recently Iraqiyya asked the all-Shiite National Alliance and the clergy of Najaf to come up with a candidate to replace Maliki, thus similarly reiterating the idea of sectarian alliances and even a role for the clergy in politics. It is true that Maliki has failed to make political gain from the only remaining issues where he can expect to win some Sunni and secular support – anti-federalism and disputed-boundary conflicts with the Kurds – but Iraqiyya’s actions show that we should not one-sidedly accuse Maliki of being the single factor behind the recent increase in sectarianism in Iraq. In some ways, Judge Midhat’s continued tenure at the supreme court symbolized the contradictions of the “State of Law” Iraq where the law makes surprising twists and turn and is certainly not applied equally across the board. But the political direction of all of this – with the Sadrists in an attack position and general sectarian polarization in the region thanks to the Syria conflict – suggests that in the long run, the situation in Iraq may be exacerbated rather than alleviated by these latest developments.